Right now we are waiting for new Tina MORGAN Figures Art to arrive at the gallery. In the meantime, here is a wider selection of the artist's work featured at the Red Rag British Gallery. Tina Morgan was born in Lynton, Devon in 1952. She studied art and design in Cornwall. After gaining an S.I.A.D. in industrial design, Tina worked as an Art Director in London for a number of top creative advertising agencies. During this time she won many awards including two at the Cannes Film Festival. In 1985 Tina Morgan decided to change career direction and began painting as a full time professional artist. Since then Tina has exhibited her art work widely and is known know for her impressionistic paintings of the coasts, markets and streets of the UK, Europe and America. Tina Morgan has been inspired by a number of artists including Royal Academicians, Fred Cuming and Ken Howard. Today Tina is a member of the Royal Society of Women Artists and has established herself as an artist with a reputation for capturing the light and the lazy day holiday buzz of people relaxing on the south Devon beaches or in cafe scenes. Her softness of palette and great skill in observing and depicting people creates art work with a timeless quality. Tina Morgan art works display a free style and subtle use of colour. 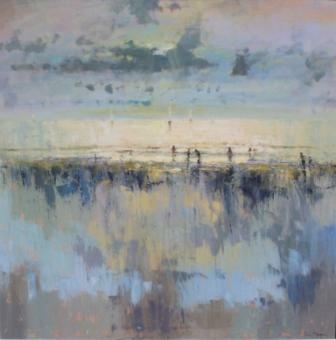 She creates a unique luminosity in her paintings which reflects her continuing love of the British coastline and landscape. In addition to Red Rag Gallery in Bath, Tina Morgan paintings have been exhibited at a number of other leading British art galleries and is now featured in many art collections worldwide.